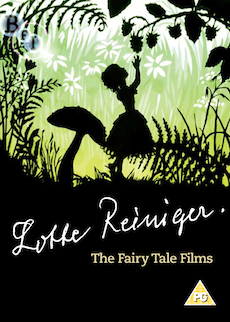 Ground-breaking animation from the legendary Lotte Reiniger. Ground-breaking animation from the legendary Lotte Reiniger. An enchanting animated film collection, with wonderful music tracks and charming narrations. Lotte Reiniger was one of the 20th century's major animation artists, pioneering a unique and distinctive style of black and white silhouette animation in her interpretations of classic myths and fairy tales. Reiniger began her career in Germany and in 1926 made The Adventures of Prince Achmed (available on BFI DVD), one of the first and most ingenious full-length animated films in the history of cinema. Her first film adaptation of a fairy tale was Cinderella in 1922. She moved to Britain in the 1930s where she joined the GPO Film Unit and later worked for the Crown Film Unit of the COI. From 1952 onwards, Reiniger, together with her husband Carl Koch, created a series of fairy tale films for Primrose Productions based on the Brothers Grimm, Wilhelm Hauff, Hans Christian Andersen and the stories from One Thousand and One Nights. Released in a two disc set with additional features and a 22-page booklet of film notes and director biography, The Fairy Tale Films is a magical collection that will appeal to children and adults alike. The Art of Lotte Reiniger (John Isaacs, 1970, 16 min). Mike Figgis's selection (extract from Friday Night Hijack, 2008, courtesty Sky Arts).